Christmas for me normally consists of the following things: flying home to good old England, walking through the door, receiving a suffocating hug from my parents (suffocating is, of course, meant in the most affectionate way possible) and then eating. The eating generally doesn’t ever stop, just ebbs and flows like the tide. So when Christmas 2013 rolled around and I found myself facing a 1000km bike ride across Cambodia — and a whole lot of rice — needless to say I was ever so slightly nervous. Maybe you’re wondering what on earth drove me to forego the usual food-based festivities in favour of risking a month of inevitable, interminable muscle pain. The honest answer is adventure. I wanted to see something new. To smell something new. To taste something new. But when I signed up for the PEPY Ride XI, I never imagined that, above all of the things I just mentioned, I would feel something new. And that something, whatever it was, has more or less changed the way I look at the world and all the funny, strange, sad, glorious, confusing and downright brilliant things in it. Read Megan’s full article on the Mission.tv blog! Are you ready to push your limits? Have you been searching for an epic adventure? Do you want to see a different side of Cambodia, one most tourists never experience? Did you just shout, “YES!” to the questions above? Then PEPY Ride X is for you! Described by National Geographic Traveler as one of their “Top Tours of a Lifetime,” this year’s PEPY Ride is not to be missed. Not only is PEPY Tours kicking off the trip with a rockin’ reunion party, but founder Daniela Papi will be joining in the adventure as well. After the party dust has settled, take off on a brand new route across Cambodia with past PEPY Riders and staff, old friends, and new faces too. Pedal east across the mighty Mekong and delve into a side of Cambodia most PEPY Tours trips have yet to explore! Want more information? Learn more on the PEPY Tours website, PEPYTours.com/pepyride or contact them directly via [email protected]. The effectiveness and ethics of short-term volunteer trips has long been a subject of heated discussion. On one hand, it is very difficult to develop the trust and respect that is necessary to build a productive working relationship in a 1-2 week period. On the other hand, taking 1-2 years off of work or school to volunteer abroad is a huge commitment that not many people can afford to make. Last week, I talked through these issues with Sarah Brown from PEPY Tours, which runs culturally-immersive educational tours in Cambodia for those looking to learn more responsible ways to travel. Read more on the Serve Smart blog! Two of PEPY Tours’ own, Daniela Papi and Anna Baranova were featured in an article today shedding light on the darker side of orphanage tourism and ways to combat the growing travel trend. Tourists often travel to Cambodia not just to see its sights, but to do good deeds too. Cambodia is a fertile field for charity; thanks to its bloody recent history (read about the Khmer Rouge and their extermination camp in Tuol Sleng), the kingdom is one of Southeast Asia’s least developed and most poverty-stricken countries, where disease, malnutrition, and death occur at higher rates than in the rest of the region. Cambodia’s become the destination du jour for a different kind of package tour: “voluntourism”, which takes visitors away from their posh Siem Reap resorts and into orphanages and poor communities. There’s an oversupply of suffering, and there’s no shortage of tourists with good intentions (and charity dollars) to spare. We were so lucky our friend Thavry could join us as a leader for the ninth annual PEPY Ride! After returning from her 1,000 km adventure, Thavry wrote an excellent blog post about her experience and the challenges she faced breaking through cultural norms. Her article is not only inspiring to Cambodian women, challenging them to test their limits and not be held back by their gender, but to people all over the world. Even if you can’t journey to Cambodia you can take a trip around your own country and gain a greater appreciation for where you came from. Read her whole story on her blog, Thavry Journey. Jenna Ke, communications and fundraising officer at our sister NGO, PEPY was published in Global South Development Magazine, a quarterly magazine focusing on development issues around the world. In her article, Tourism For Change, Jenna explains how PEPY combats the negative effects of voluntourism through our educational trips. You can read Jenna’s full article (on page 9) here. On June 7, 2013, two PEPY Tours team members, Sreyneang (Accountant) and Chor (Tour Coordinator), represented us at the first Skills Fair organized by our sister NGO PEPY. 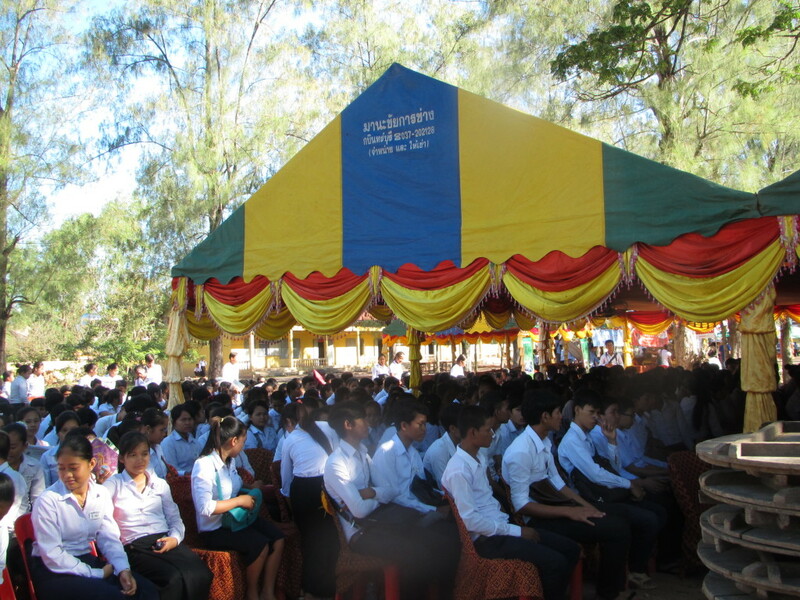 The event was held in Kralanh high school, just under 60 km outside of Siem Reap City, and was designed to connect students with various organizational representatives so they could learn about university options and future job opportunities. 700 high school students attended the fair throughout the day and many of them stopped at the PEPY Tours table to ask about the different roles available in a travel organization, and which skills are best suited to each role. Chor and Sreyneang were happy to tell students what they could do in the meantime to prepare themselves for the future, from learning Excel to thinking about the kind of roles, tasks, and activities excited them. Check out this video of Chor at the Skills Fair. Cambodia: you have to learn before you can help. to get more wings, we’d need to move it out of the PEPY Tours umbrella. Learning Service concept. We call ourselves the Learning Service Team! to more people, we’re asking for a little support via our just-launched Indiegogo campaign. chances to meet the authors, and even the opportunity to sponsor future videos. We hope you will join us, spread the word, or contribute in any way that you can! On all of our PEPY Tours adventures, we ask our participants to do a little reading from time to time. We introduce articles on a variety of different topics – ranging from the Khmer Rouge trials and education in Cambodia to community development and responsible tourism globally – and then facilitate discussions and debates based on the arguments these articles put forward. We keep a record of all the things we’re reading in the office – and all the things we’re asking our participants to read – in a kind of ‘online library’ we call The PEPY Reader. We update this resource regularly with a range interesting bits and bobs, including news articles, videos, blog posts, and more, with the aim of providing a range of perspectives on topics that are important to us. The seven worst ideas in international aid – This tongue-in-cheek article provides a concise, humorous, yet all-too-true run-down of the damage that can be caused by ‘helping’ before doing your homework. Empowering communities through relevant education – DevEd produced this creative video to explain the importance of culturally, historically, and geographically relevant education in community development. Beyond TOMS – Many have criticised TOMS and similar enterprises for hindering rather than helping. This interview talks to the founder of Oliberté Footwear, a social business working hard to provide a responsible alternative to TOMS. When volunteering becomes big business – This year Al Jazeera produced a number of different videos and articles about the problems in Cambodia posed by voluntourism. This video gives an interesting insight into the world of badly managed volunteer projects, and their repercussions. Street children, free meals, and lessons learned – Both PEPY Tours and PEPY – our sister NGO – like to be very honest and open about the mistakes we’ve made along the way (the evidence!). It’s great to see other organisations sharing the lessons they’ve learned while working on community development projects in Cambodia. The heritage curse – This video provides an interesting insight into the various damages caused to places (in this case in South East Asia) when they are officially recognised as a UNESCO World Heritage Site. The obsession with easy – This blog post from PEPY’s own Anna McKeon puts forward a convincing argument for why not everything in life should be a piece of cake. Six questions you should ask before donating goods overseas – Donating things that you no longer need feels like a good way to help those in need, right? Unfortunately, it doesn’t always work out the way you’d like it to. This handy guide will help you donate in the way that is more effective than destructive. International voluntourism guidelines: Feedback from the industry – The International Ecotourism Society and the Planeterra Foundation joined forces to produce a set of guidelines for international tourism. This comprehensive article provides an overview of what those in the tourism industry (including our own founder Daniela Papi) made of those guidelines. Obama in Cambodia – This year Barack Obama made history by being the first American president to visit Cambodia. This article explains the problems in Cambodia that Barack was keen to highlight through his visit, and how his trip contrasted with his time in nearby Myanmar. While leading learning adventures around Cambodia is a big part of what we do at PEPY Tours, we also spend lots of time thinking of ways we can promote responsible tourism practices, both among travelers and tourism professionals. In the past we have given talks at conferences and produced informational resources, which have been available to people all over the world. This year, however, we decided it was time to turn our attention a little closer to home. After a number of conversations with lovely tourism and hospitality folks in Siem Reap, we came to the conclusion that that there was a real local need for cross-cultural communication training for tourism professionals. Lots of people knew the basics of responsible tourism, but weren’t sure how to talk to travelers about controversial topics like child protection and cultural sensitivity. Luckily, we knew just the person for the job, and together with the experienced instructor Claire Bennett we put together two different training courses. Claire comes from an extensive global development education background, and has worked with everyone from the UK Government to small grass-roots organizations in rural Nepal over the past 10+ years – quite a resume! The first training course took place over three evenings, with a session each on responsible tourism, child protection, and cultural sensitivity. Delivered in both English and Khmer, this was designed as an introductory course for participants that have never attended this kind of training before, and included lots of group discussions and sharing of experiences. We learned of many insightful personal feelings and concerns about tourism and tourist interaction from the perspective of tuk-tuk drivers and temple guides who really appreciated the rare opportunity to speak their mind and openly share with others who faced similar challenges. We also ran an intensive two-day training course specifically focused on cross-cultural communication. Along with Claire, we designed this course to help those working closely with travelers feel confident in discussing topics relating to responsible tourism and cultural sensitivity, so they can in turn ensure visitors to Cambodia enjoy the country in a conscientious and engaging way. The training included lots of practical tricks for clear and respectful communication with people from other cultures, as well as tips on how to deal with difficult topics and situations. At the end of the first day participants put together skits on different tourism issues, where they got to practice their newly-learned communication techniques and test out their acting abilities too! We were pleasantly surprised by the strength of the response to these trainings from the tourism community, with a total of over 60 people attending these trainings. Some participants traveled from as far away as Phnom Penh, Kratie, and Stung Treng to join the fun, and staff from Sokha, Soria Moria, Journeys Within, Sam Vesna, Osmose, CRDT, and Haven all attended, as well as lots of independent guides, tuk-tuk drivers, and trip leaders. There were also a lot more people who were unable to make it to this session but wanted to come to any future training we offered on this topic. All in all, we thought the trainings were a success with an average participant satisfaction score of 3.4 out of 4; but what this experience has really shown us is just how hungry the tourism community is for better tourism practices and how much opportunity there is in helping responsible tourism practices grow.